George Eliot, the famous novelist, was born in 1819, daughter of Robert Evans and his second wife, and christened Mary Ann. By his first wife Robert Evans had a son, Robert, born in 1802; this Robert eventually married Jane, and they had several children, including Isaac, Robert, Frances and the much younger Alfred Henry - George Eliot’s niece and nephews. In 1854 George Eliot began living with a married man, George Henry Lewes, scandalising the Evanses, so she did not see much of her young nephew Alfred Henry, born in 1848. However, her first novel, Adam Bede, published in 1859, was a resounding success; her nephew Robert wrote to her in 1864 with news of the death of his father, who, he said, had a copy of Adam Bede in his hands on his deathbed. When Dr. Lakin was killed in an accident in 1877, Alfred Evans took over the practice and moved into the house, bringing his young nephew Howard Chavasse into the practice. Alfred Evans would remain at 1-3 High Street until his death in 1938. He was active in Sutton affairs, being elected to the Warden and Society, and when that was superseded by the Mayor and Corporation in 1886, he was elected as a councillor for Trinity Ward. At the first meeting of the new Council he was made an Alderman; J. Benjamin Stone was Mayor for the first four years, and then in 1890 Alfred Evans became Mayor of Sutton Coldfield. A short biography published in 1892 noted that “he has built up for himself a medical practice second to none in the district”, and that he had a somewhat retiring nature. Evans declined to serve a second term as Mayor, but remained a driving force in the life of Sutton, not only promoting the Provident Dispensary and the Cottage Hospital, but acting as Chairman of the Cricket Club and President of Sutton’s first Golf Club. 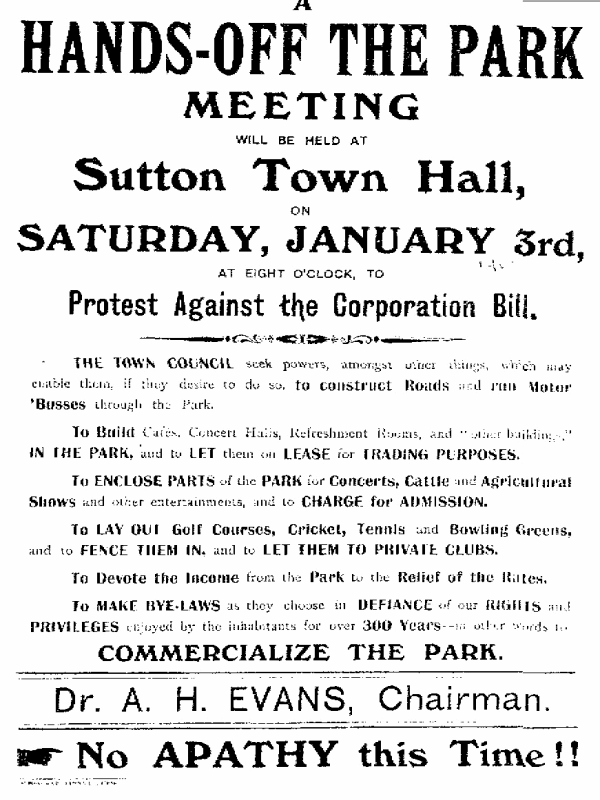 In 1920 he led the opposition to clauses in a proposed Act of Parliament which would allow development of Sutton Park, being the chairman of the “Hands off the Park” campaign. In 1924 he was “the most popular man in Sutton”; he was rewarded in 1926 with a knighthood granted “for political and public services”. He was made a Freeman of the Borough of Sutton Coldfield in 1931 for his long and distinguished service to the town. He died on Christmas Eve 1938 aged 91. 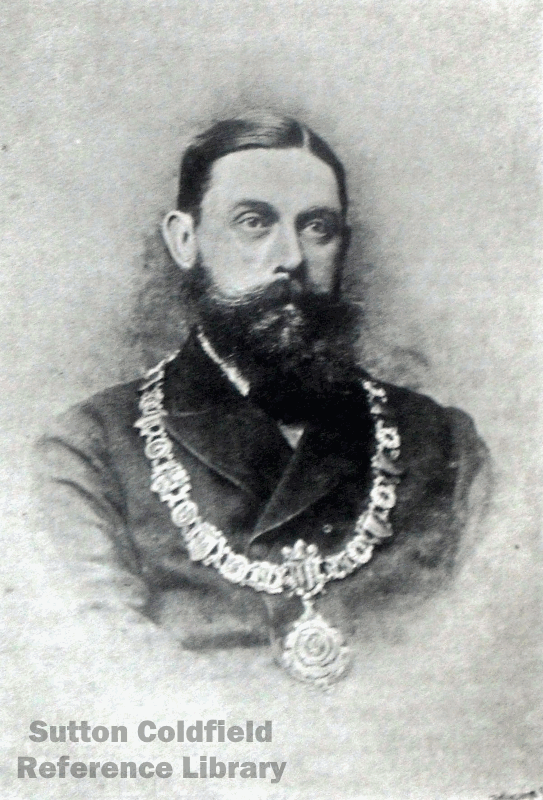 Alfred (later Sir Alfred) Evans photographed by Whitlock in 1891 wearing his Mayoral Chain of Office.